If Apple ends its exclusive carrier agreement with AT&T next year, it will likely mark the end of its estimated $450 carrier subsidy for the iPhone, a new analysis has forecast. 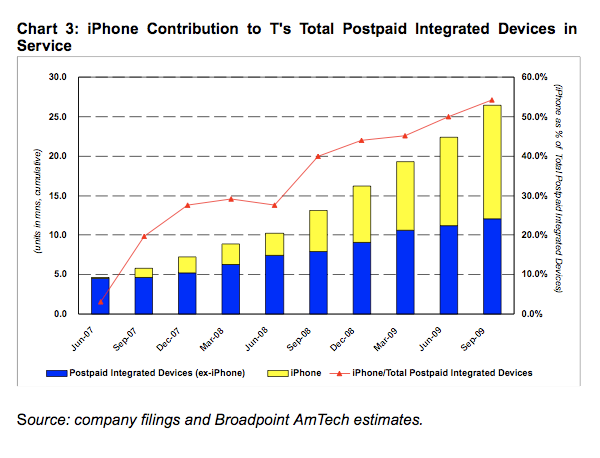 In a new note to investors, analyst Brian Marshall with Broadpoint.AmTech said that the "sweetheart" carrier subsidy provided by AT&T for the iPhone would not be attainable with Verizon. He believes that the iPhone will be added to the Verizon network in the second half of 2010, but not without consequences. A non-exclusive iPhone, Marshall forecast, would command roughly a $300 carrier subsidy. But he believes that any losses would be made up in volume, as Verizon is predicted to sell roughly 14 million iPhones in the 2011 calendar year. With an average selling price of around $500, that would be another $7 billion in revenue for Apple. "While AAPL started off with exclusive arrangements in 2007 with the original iPhone launch, the company has since migrated towards multiple carriers per region," the note said. "In our view, diverse carrier support is a key element to driving global penetration of the iPhone (from ~3% share today of the total handset market). Therefore, we believe the chances are high the iPhone will find its way onto the VZ network in 2H10." Marshall's assumption of 14 million Verizon iPhones is based on the performance Apple has had on AT&T's network. 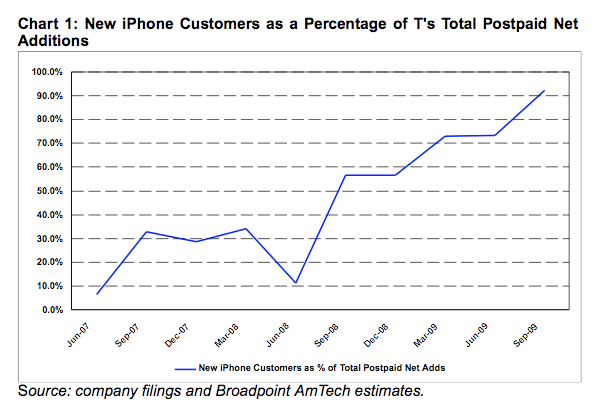 Within six quarters of the iPhone's launch, the handset has become 4 percent of AT&T's postpaid subscriber base. In the September quarter alone, the iPhone was said to represent more than 90 percent of AT&T's total postpaid additions —an increase from 57 percent from a year earlier, and 33 percent in September 2007. It is based on the strength of the iPhone that AT&T has posted subscriber gains on market leader Verizon, adding 2 million customers last quarter to Verizon's 1.2 million. AT&T activated a record 3.2 million iPhones last quarter, of which nearly 40 percent were customers new to the wireless carrier. But CEO Ralph de la Vega also predicted that the iPhone will not remain exclusive to AT&T forever, though he believes his company's portfolio will remain strong after the device jumps to other carriers.